BUFFALO, N.Y. -- The Herd claimed a 6-5 victory in dramatic walk-off fashion against Durham Friday night while Jonathan Davis shined both at the plate and in the field. The Bisons were originally ahead by four runs in the game before it yielded five unanswered runs to the Bulls. 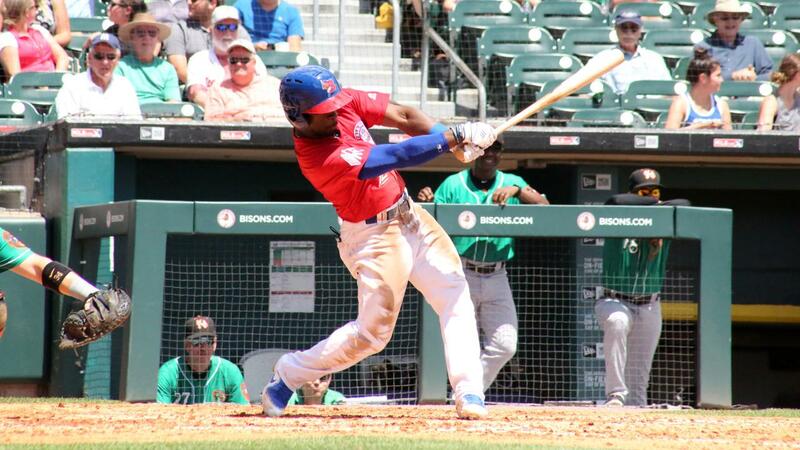 Then, the Bisons rallied from behind in the ninth to tie the game and seal the win. A big five-run frame by Durham dashed the early Buffalo advantage. The scoring was capped off by a three-run home run from Brandon Lowe--his second longball in two games. In the ninth, a pair of one-out singles put the winning run on second base and an infield single by Davis evened the score at five runs apiece. "That was my goal," Davis said about the at-bat. "To go up there and try to walk it off. It was awesome going out there in the ninth inning and competing and getting a victory." For Davis, the late-inning at-bat is the kind of spot he hopes to be in. "As a hitter, you want to be in those positions anytime you can," he said. "I think that's when the competitor comes out… You can't shy away from those moments." 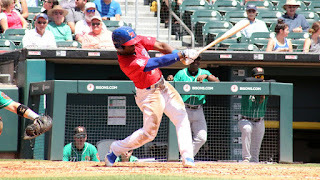 The bases were juiced after Danny Jansen was pegged by a pitch and Rowdy Tellez drove a fly ball deep enough to centerfield, allowing Dalton Pompey to tag up from third and cross home as the winning run. Davis had a great all-around performance in the game. He collected three hits and two RBI. Even when he got out, Davis put together quality at-bats and made solid contact. He not only produced at the plate but showcased his prowess patrolling the outfield. Davis made an unbelievable catch in the fifth, going full tilt to track a deep fly ball and snagging it while crashing into the left-field wall. Earlier in the game, Davis was robbed of an extra-base hit by Andrew Velazquez, who just so happened to hit the ball when he made the spectacular grab. "When he hit it, the first thing that came to my mind was he got me, I'm getting him," Davis laughed about after the game. "I wasn't even worried about the wall. I was just trying to get the ball."